I've seen this little guy in my front yard for the past 3 years. 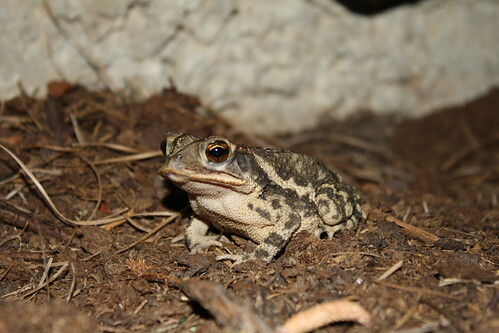 He's such a regular (I've never seen more than one toad at a time, so I'm pretty sure it's the same one), that I've decided to name him this year. Today was the first day of the year I have seen him, which is pretty early compared to the last two years. Probably because we've been watering some new flower seeds a lot and have increased the soil moisture of the area. This toad's new name is Gino. 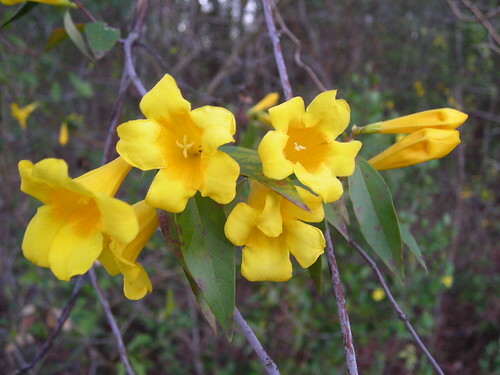 The Carolina jessamine (jasmine to some) is blooming this week. 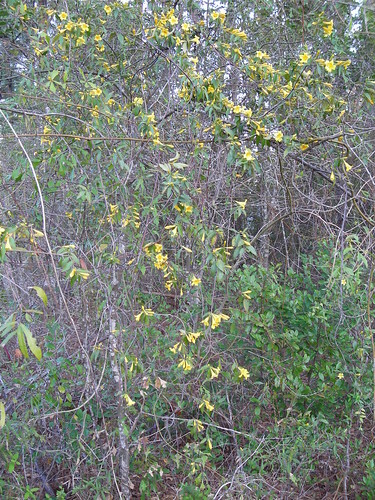 It's a native, wild, evergreen vine that blooms in early spring around here. It's thick in some woodlots, like the one next door to me. This big pine is in my yard, even. I can be pretty thick in the shrubby midstory. You don't notice it much in the summertime, but it's pretty obvious this time of year before the trees have leafed out. I will be growing some of this on my pergola this year. 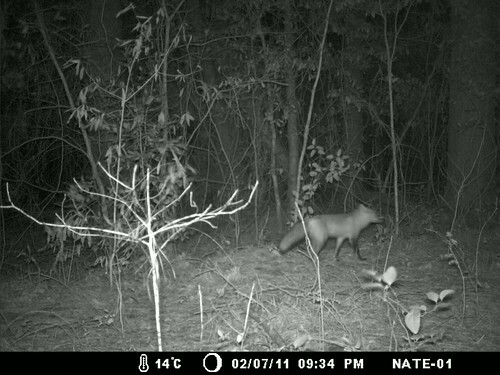 I got a pretty good picture of a red fox on my last batch of trail cam shots. There's no disputing this one, but some of the previous images generated some argument. Considering I've got foxes as regular visitors, they've probably got a den somewhere nearby. I wonder if it's the brushpile I've got going just to the right of the image. I hope not, since I plan on running that brushpile through a chipper this spring. We had some winter storms here in East Texas this winter. Nothing unusual to you folks up north, but it was enough to take down a couple of trees in my yard. Check the following evidence. 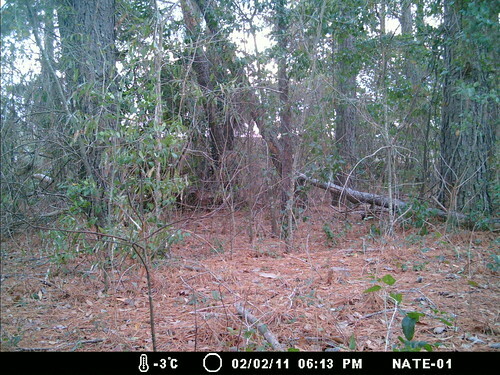 In this picture from my trail cam, you see my woods as they were before the storm. Uh-oh. A tree came down! Well, not entirely down, but it's coming. It's leaning on a tree that's not so strong, either. It's continuing to settle as the days roll on. Eventually it'll bring down the whole thicket there. I'm debating whether I can safely cut it myself, or whether I should just let it fall where it goes down. 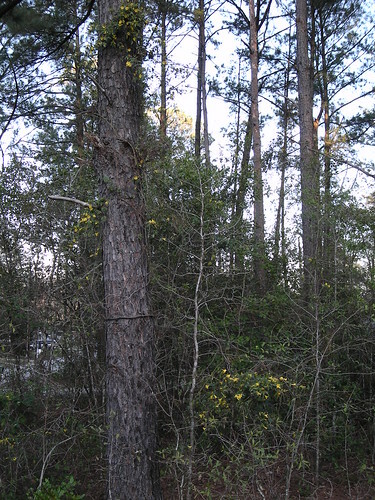 Either way, I might well plant a longleaf pine in that opening if I can get my hands on one. 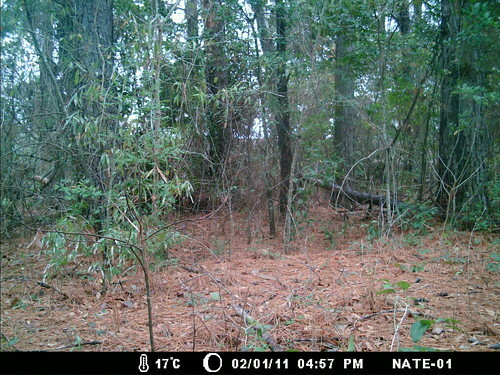 It's a pretty dry, upland site, and a longleaf would do well there. I think it'd get enough light in the opening for one as long as I kept the deciduous stuff cut back. I probably shouldn't cut the whole mess down myself. There's just too much stress in there. I probably could weaken it a little bit so it comes down on its own a little sooner. There's nothing important nearby like buildings or power lines that I need to save. Sigh...more firewood and no fireplace. Welcome to my nature blog, Nature in the Backyard. It won't all be in the backyard (we all like field trips, no? ), but a lot of it will be. I'm spinning this blog off of The GPS Geek to consolidate topics to keep my content more "pure". 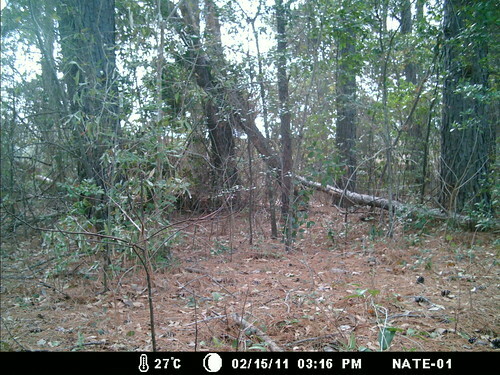 This blog will mostly include photography and trail cam pictures, with the occasional essay. Enjoy!